FREDERICK, Md. -- The development of a modified poliovirus to treat glioblastoma, a deadly form of brain cancer, is one of the latest examples of the Frederick National Laboratory for Cancer Research stepping in to fill a critical need that few others could meet with developing and manufacturing novel biological agents for early-phase clinical trials. During a Phase I clinical trial conducted by researchers at Duke University, the modified virus, “PVSRIPO”—a combination of the Sabin type 1 polio vaccine strain and a rhinovirus—was administered to patients suffering from the disease. PVSRIPO was created by Duke scientists and manufactured by the Frederick National Laboratory’s Biopharmaceutical Development Program. The patients who were treated during the trial had recurrent stage IV glioblastoma. According to the trial’s results, published in the New England Journal of Medicine, 21 percent of the 61 patients treated with PVSRIPO survived for at least three years following the treatment. The investigators compared this with a historical cohort of 104 patients previously treated at Duke using other therapies between 2007-2014 who could have been eligible for PVSRIPO had it been available. Among the cohort, 4 percent survived to three years. PVSRIPO is just one example of how the Biopharmaceutical Development Program works closely with the National Cancer Institute (NCI) in collaborating with industry, academia, and other government agencies to develop reproduceable, high-quality material suitable for its intended purpose, whether it be preclinical animal studies or early-phase human clinical trials. In the case of PVSRIPO, the process began back in 2000 when Duke University approached NCI for help with producing the virus, conducting safety tests, and supporting the clinical trial. Duke couldn’t find a contractor to manufacture PVSRIPO with expertise in working with oncolytic viruses at the clinical production level, but that is when NCI tasked BDP with the project due to the program’s capabilities. It took more than a decade for the treatment to get to the clinic. There were numerous challenges along the way, as BDP worked to produce an infectious virus that targeted cancer cells without causing polio in the patient and that met all safety standards and requirements. BDP rederived PVSRIPO in collaboration with Duke to meet production standards of Good Manufacturing Practice (GMP). The program then developed a completely new production process for creating the cell banks, the sources from which it would produce the virus. As part of the process, BDP used deep sequencing, a method for studying an organism’s genetic structure, to help prove PVSRIPO’s stability. “The BDP developed a manufacturing process that didn’t previously exist to produce and test for a highly purified, recombinant poliovirus. That allowed everything else to happen,” said Welch. The close relationship and open line of communication among the FDA, NCI, and BDP helped paved the way for the project to move forward into the clinic. 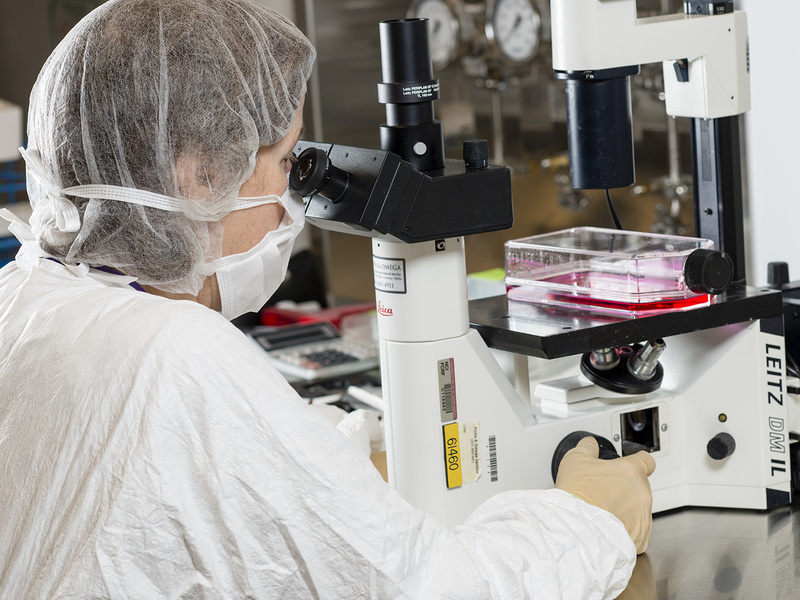 In addition to PVSRIPO, BDP has manufactured two other engineered viruses (herpesvirus and adenovirus), which are currently in clinical trials for the treatment of glioblastoma. Among its other projects, including work with other NIH institutes, BDP has been working on gene therapy treatments for muscular dystrophy and other genetic diseases. The program is also in the early development stages of setting up a new cell therapy facility to manufacture reprogrammed T cells, specifically Chimeric Antigen Receptor (CAR) T cells, for use in immunotherapy clinical trials led by NCI and extramural investigators. These projects are in areas that have drawnsignificant interest in trying to find new approaches to treat cancer and other diseases, such as recently FDA-approved gene therapy and cell therapy treatments. The first clinical trials using BDP-manufactured T cells are expected to begin next year. “We’re gearing up for that right now in a big way,” said Doug Gaum, BDP’s director of quality assurance. Image: Beverly Keseling, (retired) manufacturing manager at BDP, studies PVSRIPO on an inverted microscope.